B&B Attachments is delighted to announce that it will exhibit at Bauma Munich 2019. Bauma takes place 8 – 14 April 2019 at the Messe München trade-fair centre, Munich. Bauma is the world’s largest trade fair in the construction industry. The exhibition takes place every three years. It is an international trade fair for construction machinery, building material machines, mining machinery, construction vehicles and equipment, and has firmly established itself as the world’s leading trade fair for the industry. The exhibition brings over 3,423 exhibitors from 58 countries and 580000 visitors from 200 countries. National and international exhibitors and industry leaders gather to show their latest products and the most innovative technology in the field. This will be the first year B&B Attachments, the UK’s leading supplier and manufacturer of forklift truck attachments, will exhibit at the show. B&B will exhibit its Beam Grab and BlockMaster K320 with PowerMount attachments in hall B5 stand 304. The stand will be shared with the global leader in forklift truck attachment manufacturing, KAUP. KAUP will exhibit its 2T412V-3 block clamp attachment. KAUP and B&B Attachments have worked together in attachment development since 1980. Together their shared knowledge and expertise continue to advance the material handling industry. Bauma is the perfect platform for both industry leaders to show their latest innovations. This includes the K320, which is part of B&B’s sought after BlockMaster range, made uniquely for specialist applications within the construction industry. The range is designed to assist with the complex task of moving bricks, blocks and tiles, in a safe and efficient manner. B&B’s PowerMount quick release system enables a quick change from one hydraulic attachment to another in just 90 seconds, without the need for an engineer or any tools. 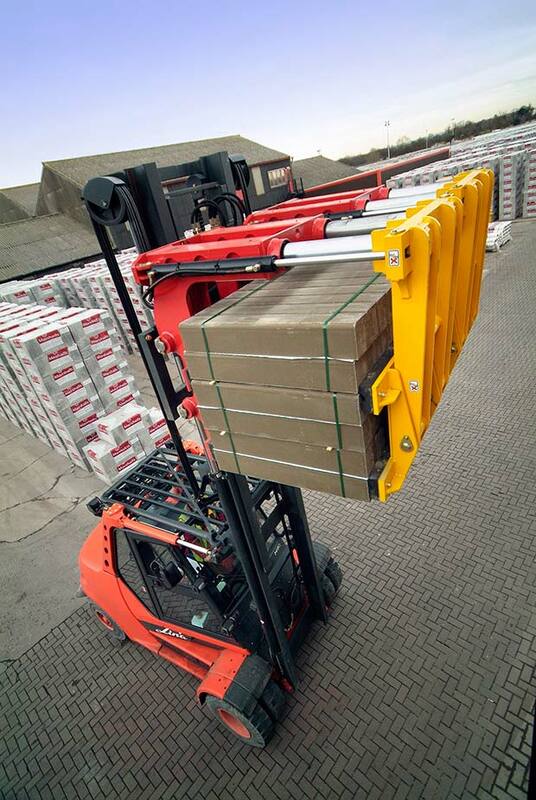 It allows one forklift truck to use several attachments, providing the best possible utilisation of a forklift fleet. B&B Attachments will also exhibit its FBG05 beam grab. This attachment has been manufactured by B&B to assist in the unloading process of pre-cast concrete floor beams. Designed to fit crane delivery vehicles, the beam grab can lift varying sized beams and profiles and handle up to six beams in one single lift. Bauma is the place to see the most important new developments from around the world. Contact B&B Attachments today to arrange an appointment with a member of its technical team at the show.